California girl sharing everyday experiences in Kuwait and here to help those who find Kuwait overwhelming. 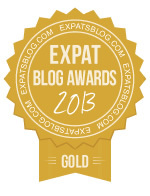 ExpatsBlog.com Expat Blog Awards 2013: Kuwait Gold Award! This blog won the Gold Award for best expat blog in Kuwait! 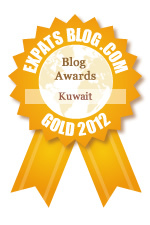 ExpatsBlog.com Expat Blog Awards 2012: Kuwait Gold Award! Great blog and loads of information about Kuwait! nice blog,but hey i need your help. am planning my industrial training and am really interested in Kuwait.can anyone hook me up with Kuwait crude oil refining company so i can submit my form or there website. Perfect blog about Kuwait! With so many places to visit listed you can have a great time! I absolutely LOVE this blog! Every time I get on the site I learn something new and exciting about Kuwait! I personally have never visited Kuwait, but the information posted on this blog really makes me want to take my next vacation there! Thanks to the administrator(s) of this blog for doing such an excellent job! Been in Kuwait for awhile and didn't know half of what I learned from this blog. Informative and Straight to the Point. Keep up the great work! Wow! This blog is great! Lots of information for us expats living in Kuwait! Lots of history and current news! Good job! I wish all blogs were this interesting and informative!